The main climatic role of carbon dioxide, as well as of a number of other gases, is to create the so-called greenhouse effect in the atmosphere. The latter consists of the following. On the one hand, C02 absorbs the downward flux of short-wave solar radiation weakly; on the other hand, it is a strong absorber of the outgoing long-wave emission in the range of wavelengths 10-18 pm. The long-wave emission absorbed by atmospheric C02 is reradiated in all directions. Downward long-wave radiation is absorbed by the Earth's surface and as a result its temperature becomes higher than it would have been in the absence of C02 and other 'greenhouse' gases. A simple estimate of the greenhouse effect for the contemporary composition of the atmosphere follows from the condition of equality between absorbed short-wave solar radiation and long-wave emission, that is, na2S0(i — ap) = 4iia2oT*, where a and Te are the radius and effective radiative temperature of the planet, S0 is the solar constant, ap is the planetary albedo and a is the Stefan-Boltzmann constant. Assuming that S0 = 1370 W/m2 and ap = 0.3 we have Te « 255 K. The temperature Te can be interpreted as the temperature at a level He in the atmosphere where the emission into space is equal to the emission of the planet as such. For the present-day atmosphere He « 6 km. Since an average vertical temperature gradient in the troposphere accounts for 5.5 K/km, then the temperature Ts of the underlying surface must be approximately equal to 288 K. The difference (Ts — Te) « 33 K is determined by the greenhouse effect of the atmosphere. According to estimates obtained on the assumption of radiative equilibrium for the atmosphere, an increase SQ in net (shortwave + long-wave) downward radiation at the upper tropospheric boundary for a doubling of the atmospheric C02 concentration is about 4 W/m2. About one-third of <5Q is consumed in Earth's surface heating; the remainder is consumed in tropospheric heating. This increases the long-wave emission by radiatively active atmospheric components (clouds, H20, C02 and other gases) and thereby enhances warming of the underlying surface. The total increase 8TS of the underlying surface temperature caused by the two above-mentioned factors is STs « 5Q/4&T3 « 0.75 K.
This estimate does not take into account the presence of feedbacks; some of these (including those discussed in Section 1.3) are able to change the resulting effect considerably. This circumstance dictates the necessity for more detailed analysis of the greenhouse effect of C02. Let us dwell on one such analysis carried out by Spelman and Manabe (1984) using the GFDL model. It covers all subsystems of the climatic system including the deep ocean and is the most exhaustive of all existing analyses. The spatial distribution of steady state changes in the zonal average temperature of air and water as a result of the quadrupled concentration of atmospheric C02 can be judged from Figure 6.3. As can be seen, the stratosphere is cooled down and the troposphere is heated up due to an enhancement of the greenhouse effect. The largest rise in air temperature is noted at high latitudes due to a decrease in albedo of the underlying surface caused by a reduction of snow and sea ice areas. Here a rise in temperature extends up to ~ 12 km, while at low latitudes it covers the whole troposphere up to ~ 18 km. 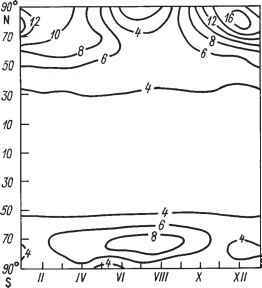 The first circumstance is explained by the influence of stable stratification at high latitudes, the second by intensive convective mixing at low latitudes. 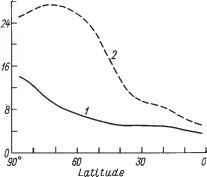 Figure 6.3 Latitude-altitude distribution of changes in the zonal average temperature (°C) for a four-fold increase in the concentration of atmospheric C02, according to Spelman and Manabe (1984). bottom. The increase in temperature of the ocean surface at low latitudes is much lower than that at high latitudes due to less heating of the surface atmospheric layer. Therefore, the total increase in temperature in the deep ocean is greater than in the UML. It is interesting to note that the largest rise in sea surface temperature takes place not in the region of the poles where heating of the atmospheric surface layer is maximum but, rather, in the vicinity of the sea ice edge (~ 75 °N). 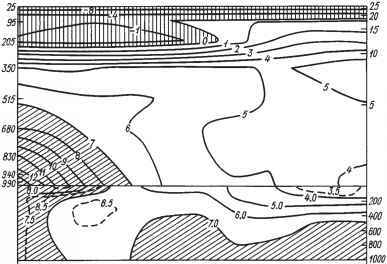 Spelman and Manabe associate this result with the influence of the Arctic halocline separating the cold and fresh UML from the warmer and salty deep layer contributing to a decrease in thickness of the UML. But their subsequent experiments carried out at the eight-fold increased concentration of atmospheric C02 do not reflect this feature. Thus the question of the maximum rise in sea surface temperature in the vicinity of the sea ice edge remains open. Changes in the zonal average temperature of air and water presented in Figure 6.3 correspond to the annual mean insolation. Consideration of its seasonal changes must transform the mentioned distribution of the zonally averaged temperature of air and water, not least because many feedbacks (say, the feedback between surface temperature and albedo of the snow-ice cover) are seasonal in nature. As an example we examine the results of numerical experiments by Wetherald and Manabe (1981) on the seasonal variability of the climatic system response to doubling of the concentration of atmospheric C02 obtained within the framework of the GFDL model with the real geography of the continents and the ocean in the form of a 'swamp' of finite heat capacity. According to Wetherald and Manabe (1981) the changes in the zonal average surface air temperature T.d at low latitudes turn out to be small and to vary little during the annual cycle (Figure 6.4). At high latitudes they are always large and are subject to marked seasonal oscillations especially in the Northern Hemisphere. The maximum rise in surface air temperature takes place at the beginning of winter when values of Ta are minimum; the minimum rise takes place in summer when values of Ta are maximum. In other words, when the concentration of atmospheric C02 increases the amplitude of seasonal oscillations of Ta at high latitudes decreases considerably. Figure 6.4 Time-space distribution of changes in the zonal average surface air temperature (°C) for doubling of concentration of atmospheric C02, according to Wetherald and Manabe (1981). in the UML and its temperature increase. But due to the large heat capacity of the UML, changes in Ta in the absence of ice are considerably less than in its presence; thus, the increase in Ta at high latitudes turns out to be comparatively small. In late autumn when convective heat transfer from the ocean into the atmosphere increases, the excess of heat in the UML results in the delay of the onset of the sea ice formation. This is favoured by an enhancement of the heat exchange between the ocean and the atmosphere and, hence, by a heating of the surface layer in late autumn and early winter. We have already mentioned that an increase in the concentration of atmospheric C02 must be accompanied by intensification of the hydro-logical cycle, that is, by enhancement of evaporation (primarily from the ocean surface) and by an increase in moisture content in the atmosphere and precipitation. All estimates obtained within the framework of three-dimensional climatic models (see Table 6.1), apart from those presented by Gates et al. (1981) and by Mitchell (1983), point to an increase in the annual mean global average precipitation. The decrease in precipitation detected by these authors relates to their fixing the sea surface temperature: for constant sea surface temperature and increased concentration of atmospheric C02, evaporation remains basically the same, although the air temperature rises a little. Accordingly, the relative humidity of the air and the non-convective precipitation decreases. Thus, if estimates by Gates et al. (1981) and Mitchell (1983) are not taken into account it can be affirmed that one of the consequences of increasing the concentration of atmospheric C02 is the enhancement of precipitation for the Earth as a whole, and, as a consequence, the intensification of run-off. A particularly large increase in precipitation and run-off must occur in high latitudes due to the growth of moisture content and enhancement of the meridional transport of water vapour. This conclusion, expressed, probably for the first time, by Manabe and Wetherald (1980) is confirmed by all numerical experiments carried out within the framework of three-dimensional models of the climatic system. It differs for other latitudes, especially for the tropics where modelling results are markedly different. When taking into account the seasonal cycle of insolation a rise in the concentration of atmospheric C02 results in an increase in zonal average values of the difference between precipitation and evaporation at high latitudes and in their decrease at low latitudes throughout the year (see Washington et al., 1980). The same situation occurs when the seasonal cycle of insolation is absent. In other words, the distribution of annual mean zonally averaged disturbances of hydrological cycle characteristics, with and without allowance for the seasonal cycle of insolation, are qualitatively similar to each other. But the presence of seasonal variations of insolation leads to the fact that the annual mean disturbances of hydrological cycle characteristics (in particular, precipitation) turn out to be less in the seasonal model than in the annual mean model. Seasonal variability of disturbances of hydrological cycle characteristics can be illustrated by calculation of the time-space distribution of changes in the zonal average soil moisture content when the concentration of atmospheric C02 is doubled (see Wetherald and Manabe, 1981). The most distinctive feature of this distribution is the increase in soil moisture content at high and temperate latitudes of the Northern Hemisphere (in the zone 30-70 °N) in winter and its decrease in summer. This last circumstance is determined by an increase in the duration of the warm period due to earlier melting of snow. Note that enhancement of large-scale drying of northern high and mid-latitude continents during summer in the 2 x C02 experiment is confirmed by most three-dimensional models cited in Table 6.1, and disagrees with the results of the numerical experiments of Hansen et al. 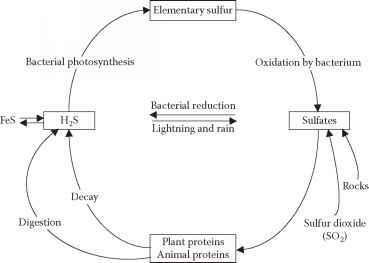 (1984), Washington and Meehl (1984, 1989) and Mitchell and Warrilow (1987) since the soil in their control experiments is not close to saturation. Therefore, although the summer season increases, nevertheless soil moisture at the beginning of this season increases, too, in consequence of enhanced winter precipitation, so that enhanced summer drying may not be produced. Now, we turn to analysis of temperature changes caused by an increase in the concentration of atmospheric C02. The time-space variability of these changes remains the same for all three-dimensional models of the climatic system in a qualitative, but not in a quantitative, respect. It is essential to understand the causes of such discrepancies. For this purpose we take advantage of available estimates of changes (5Ta)nX in the annual mean globally averaged surface air temperature Ta when the normal (present-day or pre-industrial) concentration X of atmospheric C02 increases by n times. Note: the observed values Ta and P are equal to 14.2 UC and 2.65 mm/day respectively. Dashes indicate unavailable information. resolution and sophistication of a model it seems that the accuracy of description of feedback effects should be higher and the range of possible values of (STa)2X should have been less. But this does not occur for the following reasons. The point is that even three-dimensional models differ from each other in their methods of description of cloudiness and convection in the atmosphere, and of thermal inertia and heat transport in the ocean. They also differ in the size of the domain examined, in the topography of the land surface, in the distribution of land and ocean, in the spatial resolution, and in the prescribed values of external parameters (the solar constant, albedo of land and sea ice, etc.). Finally, they take or do not take into account the seasonal variability of insolation. Let us consider the ways in which the main distinctions affect the estimates of STa obtained within the framework of three-dimensional climatic models. Cloudiness. An increase in the concentration of atmospheric C02 is accompanied by an increase in cloudiness in the low troposphere and in the stratosphere of high latitudes, and by a decrease in cloudiness at all levels in the troposphere of temperate and low latitudes. Such changes in cloudiness detected in all numerical experiments using three-dimensional models are determined by the dependence of cloudiness on the relative air humidity. Indeed, an increase in surface air temperature leads to the intensification of local evaporation and the increase in air absolute humidity. Under conditions of stable stratification the main changes in absolute humidity occur in the low troposphere. Because temperature changes decrease with height, it is obvious that air relative humidity and, hence, cloudiness will increase markedly in the most stable stratified troposphere of high latitudes. Increase in the relative humidity in low layers of the stratosphere is apparently connected with enhancement of moisture transfer through the tropopause due to weakening of hydrostatic stability. As for a decrease in the relative humidity in the troposphere of low and temperate latitudes, this is caused by the intensification of upward, and suppression of downward, vertical motions due to an increase in heat release under phase transitions of water vapour. Since enhancement of relative humidity in an upward flow is limited (relative humidity cannot exceed 100%) and its decrease in a downward flow is not, then the area-weighted average values of relative humidity and fraction of cloudiness decrease. The explanation given above is valid in those cases where the processes of moisture condensation, cloud formation and convective precipitation are parametrized in terms of the limiting relative humidity. But if cloudiness is determined in another way (say, by using an equation for cloud water) or some more sophisticated parametrizations relating cloud radiative property variations with cloud water content and/or temperature is applied then the qualitative features of cloud distributions are saved but can be explained by other causes (say, by cooling of the upper layers of the troposphere, by subsequent enhancement of convective mixing and then by an increase in water vapour content, relative humidity and cloudiness in the upper part and their decrease in the lower part of the troposphere). We present available estimates of the influence of cloudiness on the sensitivity of the global average surface air temperature to an increase in the concentration of the atmospheric C02. According to Manabe and Wetherald (1980) the value of (^ra)2X when considering the feedback between radiation and cloudiness increases by only 0.1 °C. In other words, enhancement of absorption of long-wave radiation in the atmosphere determined by an increase in cloudiness is almost totally compensated by a decrease in short-wave solar radiation due to an increase in the planetary albedo. Washington and Meehl (1983) arrived at the same conclusion, according to which values of (¿Ta)2X for fixed and calculated cloudiness are approximately equal, with values of (<Sra)4X in the second case being larger by 0.7 °C than those in the first case. A different result was obtained within the framework of the GFDL model using the realistic geography of the continents and presentation of the ocean in the form of a 'swamp' with finite heat capacity. It turned out that subsequent doubling of the concentration of atmospheric C02 accompanied by a change in cloudiness are almost exactly the same as those for quadruple increase in the concentration of atmospheric C02 and fixed cloudiness: (<5fa)2X = 4.0 °C in the first case, and (<Sfa)4X = 4.1 °C in the second case. We note that the estimates by Manabe and Stouffer (1980) and Wetherald and Manabe (1986) were obtained with an allowance for the seasonal variability of insolation whereas those mentioned earlier were not. Because of this distinction the effects of the feedback between radiation and cloudiness can be associated with a more marked increase in cloudiness in the low troposphere of high latitudes in the case where the seasonal variability is not taken into account rather than in the case where it is taken into account. Seasonal changes in insolation. According to Wetherald and Manabe (1981), an allowance for the seasonal cycle of insolation, all other things being equal, results in a decrease in (¿ra)4X by 1.2 °C. As has already been mentioned above, this decrease in sensitivity of the seasonal model is associated with the disappearance of snow and sea ice at high latitudes in summer in a period of maximum insolation. Opposite changes in (STa)nX were obtained by Hansen et al. (1984) and by Washington and Meehl (1983, 1984), who ascertained that an allowance for the seasonal variations of insolation results in a decrease in (dTa)4X by 0.3 °C and 2.2 °C respectively. The inconsistency of the estimates is explained by the different parametrizations of cloudiness and presentation of land and ocean: the estimate by Wetherald and Manabe (1981) complies with fixed cloudiness and the idealized distribution of land and ocean, while estimates by Hansen et al. (1984), and Washington and Meehl (1983, 1984) result from calculated cloudiness and use of the realistic distribution of land and ocean. But it is not improbable that the effect of seasonal variability of insolation in the last three works quoted is masked by other distinctions between the models, particularly by the different heat capacities of the ocean. Thermal inertia of the ocean. It appears that an allowance for this does not affect the equilibrium response of the climatic system, although this statement holds only for the case where the ocean is represented as a 'swamp' with finite heat capacity, and seasonal (and, in general, any other) oscillations of climatic characteristics are absent. Otherwise, an allowance for thermal inertia of the ocean must lead to a change in amplitudes and phase shifts in seasonal oscillations of climatic characteristics, to weakening or enhancement of feedbacks and thereby to the transformation of the equilibrium response of the climatic system to external forcing. 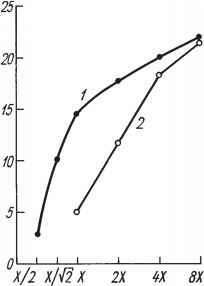 (1985) and Spelman and Manabe (1984) recommend (<5rj2X = 3.2 °C and (<S7;)4X = 5.4 °C. The estimates presented point to the strong influence of the ocean thermal inertia on the sensitivity of the surface air temperature to an increase in the concentration of atmospheric C02. Unfortunately, they were obtained along with simultaneous changes in a number of other climate-forming factors (see Table 6.1) and therefore it is difficult to extract more detailed information from them. Heat transport in the ocean. It is clear from general considerations that an allowance for the heat transport in the ocean (primarily in the meridional direction) has to be accompanied by a rise in the sea surface temperature at high latitudes, by a reduction in the sea ice area, by an increase in the surface air temperature and by a decrease in the snow-covered areas on the continents. The displacement of boundaries of snow cover and sea ice cover into higher latitudes must result in a weakening of the feedback between surface air temperature and the albedo of the underlying surface. In fact, since insolation and the length of the latitudinal circle decreases with an increase in latitude, then the displacement of boundaries of snow cover and sea ice into higher latitudes must result in a decrease in absorbed solar radiation changes and, hence, in changes in the temperature of the underlying surface and surface atmospheric layer. Thus, an allowance for the meridional heat transport in the ocean must decrease the surface air temperature sensitivity to an increase in the concentration of atmospheric C02. Figure 6.5 Meridional distribution of the zonal average surface air temperature for a four-fold increase in the concentration of atmospheric C02 with (1) and without (2) allowance for the heat transport in the ocean, according to Spelman and Manabe (1984). when it is not. In other words, due to the damping influence of the ocean, smoothing of the latitudinal distribution of changes in the air surface temperature occurs. Generally speaking, when estimating climatic system sensitivity to an increase in the concentration of atmospheric C02, one should keep in mind its dependence on the accuracy of reproduction of the present-day climate. From Figure 6.6 it can be seen that the values of (dTa)nX decrease with increased Ta as a result of contraction of sea ice and snow cover areas and of the accompanying weakening of feedback between Ta and the albedo of the underlying surface. The existence of a strong dependence between 5Ta and Ta for the normal concentrations of atmospheric C02 suggests that it is precisely this that causes changes in dTa in the case where the heat transport in the ocean is taken into account. Indeed, according to Spelman and Manabe (1984), Ta for the normal concentrations of atmospheric C02, with an allowance for heat transport in the ocean, amounts to 14.4 °C, whereas without allowance for this transport it amounts to only 5.2 °C, that is, the influence of the ocean heat transport on (3Ta)nX is masked by the change in the annual mean global average surface air temperature for the normal concentrations of atmospheric C02. Figure 6.6 Global average surface air temperature Ta as a function of the concentration of atmospheric C02, according to Manabe and Bryan (1985). Curves (1) and (2) were obtained with and without allowance for heat transport in the ocean. it is not taken into account. A change in dTa with an increased concentration of atmospheric C02 from X to 2X in the first case, and from 2.7X to 5.4X in the second case, is equal to 2.8 and 5.4 °C respectively. The difference ( — 2.6 °C) between these values serves as a measure of the immediate influence of the ocean heat transport on the sensitivity of Ta to doubling of the concentration of atmospheric C02. Incidentally, we note one interesting feature of Figure 6.6: the heat transport in the ocean decreases the sensitivity of Ta with an increase in the concentration of atmospheric C02 from X to 8X and increases its sensitivity with a decrease in the concentration of atmospheric C02 from X to X/2. Manabe and Bryan (1985) explained this rise in sensitivity in the following way: a decrease in the concentration of atmospheric C02 results in a drop in surface air temperature and sea surface temperature, in a weakening of the heat exchange between the ocean and atmosphere at high latitudes and convective mixing in the area of cold deep water formation, in a decrease in the upwelling velocity and the meridional heat transport in the ocean, and, finally, in an increase in the area of sea ice, that is, an enhancement of feedback between the Ta and albedo of the underlying surface. From the above it is clear that the correct determination of sensitivity is impossible in the absence of an adequate reproduction of the observed annual mean global average surface air temperature. But not all the available estimates satisfy this requirement (see Table 6.1). Moreover, even if it is fulfilled, this does not mean that the model does not distort the average values and time-space distributions of other climatic characteristics. For example, despite small distinctions in the value of the annual mean surface air temperature obtained by Manabe and Stouffer (1980), and by Wetherald and Manabe (1986), and their proximity to the observed value of Ta (see Table 6.1), the estimate of (5fa)2X in the first of the works mentioned is twice that in the second of the works mentioned (if (STa)2x is determined as (ST,a)4X/2). This can be caused not only by rejection of an assumption on fixing cloudiness but also by an increase in the sea ice area in the Southern Hemisphere. Thus any model intended to examine sensitivity must reproduce (and quite precisely) all the major features of the present-day climate. Otherwise, hopes of obtaining reliable estimates will be dashed whichever sophisticated model forms its basis.